In this stunning underwater adventure teeming with memorable comedic characters and heartfelt emotion, Finding Nemo follows the momentous journey of an overprotective clownfish named Marlin (voiced by Albert Brooks) and his young son Nemo (voiced by Alexander Gould). When the two are unexpectedly separated in the Great Barrier Reef, Nemo is carried far from his ocean home and deposited in a fish tank in a dentist’s office. Buoyed by the companionship of Dory (voiced by Ellen DeGeneres), a friendly-but-forgetful blue tang fish, Marlin embarks on a dangerous trek and finds himself the unlikely hero of an epic effort to rescue his son – who hatches a few daring plans of his own to return safely home. 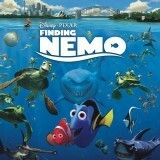 Finding Nemo is now available for the first time ever in high-definition Blu-ray, Blu-ray 3D and Digital platforms! Much like the Disney movies of old like Bambi, Finding Nemo has it’s share of darkness and sadness but it gets it out of the way right at the start of the film. We see two clown-fish checking out their new home where they are going to raise their children. The eggs are about to hatch and Marlin (Albert Brooks) and Coral (Elizabeth Perkins) couldn’t be happier. Their happiness is short-lived when a barracuda arrives and attacks them, knocking out Marlin and killing Coral when she tried to save the eggs. When Marlin wakes up, Coral is gone along with the eggs except for one damaged egg. Heartbroken, but happy to have at least one egg left to remember Coral by, Marlin names the egg Nemo which was the name Coral liked. Time passes and Marlin in the meantime has become an overprotective father to Nemo, partly because of what happened to Coral and partly due to Nemo’s bad fin that was damaged when he was in the egg. During Nemo’s first day of school, Marlin is a nervous wreck and ends up embarrassing Nemo due to his unchecked worrying. Nemo acts out by going out into the ocean against his father’s wishes and ends up getting captured by a well-intentioned dentist who thought Nemo was struggling. The diver returns to the boat and takes off before Marlin can catch up in time to save his son. The only clue to where Nemo was taken is the diver’s mask that fell off the boat that has his address on it. While chasing after Nemo, Marlin literally runs into a friendly fish named Dory (Ellen DeGeneres) who it turns out suffers from short term memory loss. Dory offers to lead Marlin in the direction that the boat went, but after a couple of minutes she has completely forgotten all about the boat and Marlin. Things get even worse when they get surrounded by sharks, but lucky for them these sharks are part of a “Fish Are Friends” group that’s trying to stop eating other fish. Marlin and Dory are forced to go to the intervention meeting with the sharks where they are supposed to participate. When Marlin accidentally gives Dory a bloody nose, the scent of her blood makes Bruce (Barry Humphries), a giant great white shark go blood crazy and he tries to eat them. During their escape, Dory remembers that she knows how to read so she’s able to read the address on the mask so the two know that Nemo was taken to Sydney, Australia. Meanwhile, Nemo is having an adventure of his own now that he’s been dumped in a fish tank in the dentist’s office. There he discovers the “Tank Gang” that consists of a puffer fish known as Bloat (Brad Garrett), a yellow tang named Bubbles (Stephen Root), a starfish named Peach (Alison Janney), a Royal gramma named Gurgle (Austin Pendleton), s shrimp known as Jacques (Joe Ranft), a Blacktailed Humbug named Deb (Vicki Lewis), and their scarred leader Gill (Willem Dafoe). They warn Nemo that the dentist plans on giving him to her as a present, which would be a bad idea because she has a tendency to kill fish from being too rough on them. Gill concocts a plan for them to escape that puts Nemo at risk, but Nemo is desperate enough to escape that he accepts the danger. When a visiting pelican named Nigel Geoffrey Rush) shows up. the fish tell him all about Nemo’s tale. En-route to Sydney, Marlin and Dory encounter dangerous jellyfish, a whale that swallows them, and rode with a convoy of turtles in the East Australian Current, (or the swirling vortex of terror as Marlin likes to call it). Their journey has become famous as the various birds, fish, dolphins and more all pass on the story and it becomes so well known that when Nigel hears about it, he instantly realizes that Marlin is Nemo’s father and he returns to the fish tank to let Nemo know that his dad is coming for him. Knowing that his overcautious father was looking for him and facing the by now exaggerated risks to do so, Nemo decides to take some risks of his own in order to escape the tank once and for all. By the end of the movie, both Marlin and Nemo are driven to reunite by their love for each other and they are helped by a collection of new friends that they met in the process. Finding Nemo is one of my favorite Pixar films as it has a fantastic script that works on many levels and also because the characters are so well-defined and the animation is just beautiful to see. It’s also rare that you get to see a father trying to save his son, so as a father to a young boy, this story also touched more more than most. Every parent can relate to wanting to protect their child at all costs, even to the point of inadvertently over-protecting them. Of course, that kind of love and protection can come at a cost. As Dory points out, “ You can’t never let anything happen to him. Then nothing would ever happen to him. Not much fun for little Harpo.” The movie offers a lot of good lessons that are presented with humor such as learning to let go, trust in your friends, and always hope for the best. After seeing this movie in 3D in the theater, I already knew that the 3D would look good on Blu-ray and I was right. Both the 2D and the 3D transfers offer some gorgeous colors with the multi-hued fish and undersea environments that look amazing on Blu-ray. Detail is also impressive as these digital to digital transfers from Disney/Pixar usually are. Contrast is dialed in perfectly and the black levels are pitch black and solid. The 3D transfer looks just as good as the 2D versions and the added depth really made the undersea environments come alive and look even more beautiful. From the darting fish who swim to and fro throughout the frame to the added immersion gained from the various fish and objects between the foreground and background, the 3D transfer brings the movie to life. The jellyfish sequence looked especially good, but then again, the entire film seems to have been conceived and planned for 3D. This 3D transfer adds depth and immersion and it’s not one of those films that exist just to showcase a lot of 3D gags. There’s some of those kind of shots but overall, this is about creating a realistic environment that place the viewer there, and it succeeds brilliantly at accomplishing that. These are beautiful transfers and I don’t have any complaints about either one. If I had to pick between the two, I would go with the 3D version as it looks just as good as the 2D version, but it also benefits from the fantastic 3D experience that makes it even more captivating. Finding Nemo’s Dolby TrueHD 7.1 mix is also perfection itself. Every line, sound effect, and every bit of the film’s soundtrack from Thomas Newman comes across crystal clear and exactly where it should be. The dialogue is clear and clean with every line understandable no matter what action is taking place on screen. The rear speakers are in constant use as they deliver an abundance of surround activity that is dead accurate and lively. Whether it’s the school of fish assembling and reassembling to give directions, or the bubbles percolating in the dentist’s aquarium, it all sounds incredible and the directionality is spot on. This entire mix is thrilling, especially during the scenes where it’s allowed free reign like when Bruce the shark is chasing Marlin and Dory which results in a mine-field blowing up which sounds incredible thanks to this mix. I can’t say enough good things about this 7.1 mix so pick the movie up yourself so you too can experience it’s awesomeness! This is another jam-packed set from Disney that’s full of supplemental goodness! Not only do we get new extras in high definition, but we also get all of the great standard definition extras from the previous DVD release. Cine-Explore - This extra is the meat and potatoes feature to watch as it’s a hundred and one minute picture in picture commentary between Director Andrew Stanton, co-director Lee Unkrich and co-writer Bob Peterson (squirrel!) about the making of the film. They talk about the ideas behind it and their discussion includes examples such as concept art and more. This in depth conversation is the one to watch. Finding Nemo: A Filmmakers’ Roundtable - This extra is a sequel of sorts to the Cine-Explore commentary as this roundtable reunites Stanton, Unkrich, and Peterson, but also adds producer Graham Walters, production designer Ralph Eggleston, and Oren Jacob for retrospective that was done during the 10th Anniversary of the film. Reinventing the Submarine Voyage - A cool extra for fans of Disneyland, this extra takes a look at the evolution of the Submarine Voyage’s 20,000 Leagues Under the Sea roots to the new version that incorporates characters from Finding Nemo. A Lesson in Flashbacks - Director Andrew Stanton talks about lessons he learned during the writing process of the movie. Deleted Scene – This is an alternate opening sequence shown through some concept art. Knick Knack – A cute short by John Lasseter about a frustrated snowman in a snow-globe. Art Review - A nine minute look into the pre-production of the film with Production designer Ralph Eggleston, character art director Ricky Nierva and shading art director Robin Cooper talking about their efforts. Making Nemo - This behind the scenes extra from the original DVD release is my favorite of the ported extras as it gives us almost thirty minutes of seeing how it was done. We see a concise rundown of influences, inspirations, and work that was undertaken to make the movie. Exploring the Reef - Alook at endangered coral reefs with Jean-Michel Cousteau as our guide. Studio Tour - Alexander Gould takes us on a tour of Pixar Studios. Deleted Scenes - Six minutes of fun deleted scenes that include: “Crush the Hippie,” “Shark Volleyball,” “Frantic Dad,” “Scent of Lavender,” “Sewage,” “Prologue Bedtime Story”, and “Soap Opera/Gil Lies,” which are shown through animated storyboards. Mr. Ray’s Encyclopedia - A cool learning extra that’s interactive with an encyclopedia with videos of real sea-life. Aquariums - I know most people probably won’t care about this extra but I love it. We get a collection of six different screen-savers that includes: “Anemone,” “Jellyfish,” “Plate Coral,” “Reef,” “Sandy Reef”, and “School of Fish” spread out across the discs. I think it’s very cool myself. This is one of my favorite Pixar movies and it works on several levels. It’s a movie that my young son can enjoy on a surface level, but it also offers some deeper meaning and lessons for older viewers. It’s also nice to see one of these animated movies where it’s the Dad trying to do the right thing by his child for a change. It’s a great movie and this 2D/3D Blu-ray set is just amazing across the board. The video quality and the 3D aspects look fantastic and the audio is reference quality too. The extras are just as good and there’s a ton of them to help you appreciate the movie even more. This movie is highly recommended!